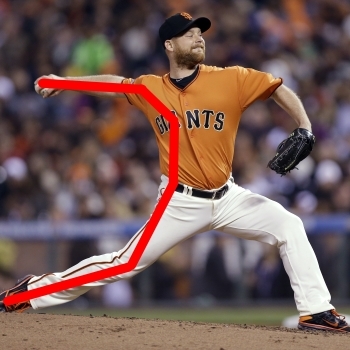 As I've repeatedly made clear, the problem with arm actions like the Inverted W is NOT the position itself, it's that positions like the Inverted W tend to create a Timing problem and recent research demonstrates that Timing problems are the root cause of the problems that inverted arm action pitchers so often experience. While the Inverted W only tends to create a Timing problem, today I learned of a cue that always creates a Timing problem. 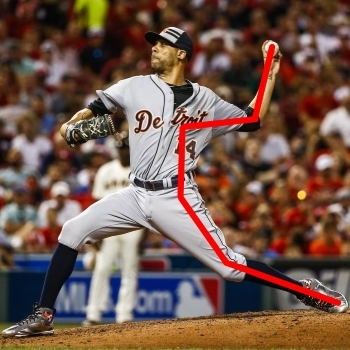 It's called the Power C.
The problem with the Power C is that the pitching arm is flat -- at or close to 0 degrees of external rotation -- when the front foot is down and the shoulders start to rotate. When I first heard the term "Power C," these pictures of Chad Gaudin, Homer Bailey, and Daniel Bard immediately came to mind. That is the definition of a serious Timing problem and, for ease of understanding and visualization, I refer to it as Flat Arm Syndrome. 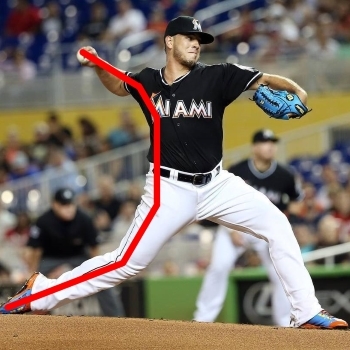 As I explain in my Jose Fernandez pitching mechanics analysis, while he exhibits both an Inverted L and Premature Pronation, the ultimate root cause of Jose Fernandez's injury problems is how his pitching arm is flat at foot strike. 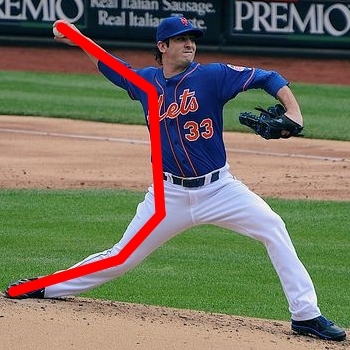 Of course, a flat arm at foot strike is a key component of the Power C.
As I discuss in my analysis of Matt Harvey's pitching mechanics, while I think the cue he was taught was the Power T, it could just as easily have been a Power C, given that a Power C is basically half of a Power T. Regardless the problem with both the Power C and the Power T is that the pitching arm is flat, and horizontal to the ground, at front foot strike. In contrast, if you look at David Price at foot strike, he is at what I call the Ready Position.